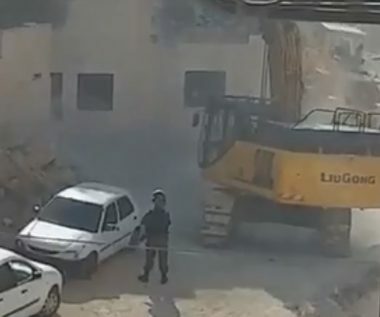 Dozens of Israeli soldiers invaded, on Wednesday morning, Ras Shehada area, in Shu’fat refugee camp, in the center of occupied East Jerusalem, and demolished a residential building. The soldiers surrounded Ras Shehada area, and completely isolated it, before demolishing the building, owned by members of Sa’iri family. The demolished property is located near the illegal Annexation Wall in the area, which became surrounded from several directions. In related news, the soldiers invaded Khirbat Thaher al-Maleh, south of Jenin, and demolished a wall surrounding a local cemetery, without a prior notice. It is worth mentioning that, back in February of this year, the army illegally confiscated 492 Dunams of Palestinian land in that area, to use them for the illegal wall and colonies.